Searson has toured for well over a decade and have the confidence and drive to continue with their musical careers more than ever before. Sisters, Erin and Colleen Searson have developed their own original style of high energy fiddling, passionate vocals and step dancing. The sisters perform on a variety of instruments throughout their live show which includes Colleen on fiddle, vocals and Ottawa Valley Step Dancing while Erin performs on piano, vocals, Ottawa Valley Step Dancing and tenor guitar. Rounding out the live show is bass/guitar player Fraser Gauthier, who has studied at Humber College and Capilano University, gradually gravitating towards roots music. Dave MacDougall is a drummer and percussionist who brings creativity and groove to a variety of styles of music. In the past 10 years, Searson has toured throughout Canada, the United States, Germany, Denmark, Portugal, Switzerland and the Caribbean. They have brought hundreds of fans with them on various bus tours while performing throughout Ireland. Growing up in the Ottawa Valley, Ontario, Canada these sisters began to study music at a very young age, performing locally and competing at Step Dance & Fiddle Contests. Since the age of 4, Erin has been classically trained through the Royal Conservatory of music in piano. Colleen has been studying violin and fiddle methods from all styles around the world since age 9 while both began step dance lessons before the age of 9. This prepared the sisters to grow and expand as they became accomplished performers and musicians and increasingly began to tour across borders and overseas. Giving Canada’s old time sounds a renewal into modern roots. Seamlessly blending spirited fiddling, energetic dancing and gorgeous harmonies. We Are Getting Ready To Record Our 10th SEARSON Album! Here's your chance to be a part of this project in the most unique way possible. We are recording our 10th album, live, at the beautiful & historical NEAT COFFEE SHOP in Burnstown, ON. We want to share our little corner of the world with you. But, even more exciting, is that we are also filming a live DVD of this special day & performance. We would love to see familiar & friendly faces in the crowd, so we can watch & re-watch & re-watch this special moment forever! We will be performing 2 separate shows for this event! A matinee, and an evening performance. So join us, for what is sure to be one of the most memorable events in our musical career! WE ARE VERY EXCITED TO BE ATTENDING FOLK ALIANCE INTERNATIONAL THIS FEBRUARY IN KANSAS CITY! Searson will be ringing out 2017 by celebrating Canada's 150 with a new album and a special hometown concert. 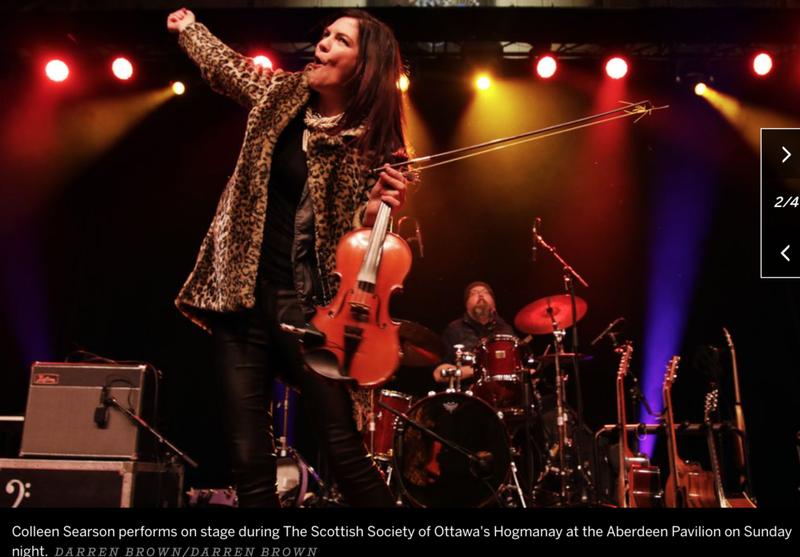 Home for the holidays, Canada's pre-eminent Celtic pop group is in the midst of releasing their ninth studio album, “Homegrown,” a tribute to those Canadian artists, songwriters and instrumentalists who have influenced the band. To close out the year, Searson will be hosting an album release show at the Wilno Tavern on Saturday. “Homegrown” features six tracks in which Searson covers songs from Bryan Adams, Neil Young, Chantal Kreviazuk, Robbie Robertson, Natalie MacMaster and Denis Lanctot. The album aims to take the listener on a journey from coast-to-coast with the soaring vocals, rich string arrangements, and exquisite piano that Searson has become known for. Produced and engineered by Colin Wylie at the Old Church Recording in Douglas, “Homegrown” includes Richard Irwin on drums, Fraser Gauthier on bass, and Wylie on guitar. With 2017 being the 150th anniversary of Canadian confederation, the group wanted to do something unique. The project was quickly put together beginning in January when the sisters went through a list of artists and narrowly their choices down to six. The tracks were laid down over a few sessions in June. Each one has positively influenced them not only in their decade-long career but growing up in the Ottawa Valley as well. For instance, the sisters still remember going to the Pembroke Oldtime Stepdancing and Fiddling Contest to see Denis Lanctot perform. They have also toured the world, primarily the United States, Germany, Denmark, Portugal, Switzerland and the Caribbean, and seen the impact that Natalie MacMaster has made. The next year will be a busy one for the sister act. In February, Searson will attend the Folk Alliance International in Kansas City, Missouri. The annual conference is the world's largest gathering of the folk music industry and community. They will be returning to Alaska in the spring and are also scheduled for some dates in Europe over the summer. While their Ontario dates are still up in the air, the group will be back at the Neat Coffee Shop in Burnstown in the fall. “Homegrown” is available on iTunes. Copies can be ordered on the Searson website at: www.searsonband.com. Searson will be perfoming at the Wilno Tavern in Wilno on Saturday, Dec. 30. Showtime is 8 p.m.
TAKE A VISIT OVER TO OUR SOUNDCLOUD PROFILE. FOLLOW THE BAND! CHECK OUT OUR NEW SHIRTS & HATS OVER ON OUR MERCH PAGE! LOOKING FORWARD TO SHARING THE STAGE THIS SUMMER WITH SOME OF OUR FAVOURITE BANDS IN THE WORLD. ALASKA, HERE WE COME! HAPPY BIRTHDAY TO COLLEEN! WHAT AN INCREDIBLE YEAR. CHEERS TO YOUR LIFE SO FAR! A WONDERFUL EVENING IN EGANVILLE! MANY GREAT MUSICIANS CAME OUT TO ENJOY THE FESTIVITIES. Mom has always been the professional videographer of the family. CHECK OUT THE SNEAK PEEK OF OUR NATIONAL TELEVISION TAPING WITH CBC CALLED "STILL STANDING". WE WILL BE FEATURED REPRESENTING THE HISTORY AND CULTURE OF OTTAWA VALLEY FIDDLING & STEP DANCING. STAY TUNED FOR OUR AIR DATE COMING THIS SUMMER! Their latest album, Stars Above The Farm (2015) is a 12 track album that has brought the sisters back to their musical roots. Writing both vocal and instrumental tracks, the album is a nod to their upbringing in such a rich and vibrant musical culture. The album was recorded at Skylark Studios with Jordon Zadorozny as Producer. Two highly acclaimed Canadian Fiddle champions join Colleen on the album. April Verch, on the track Cuddy's Waltz which was wriiten by Colleen & April Verch. And, Voyageurs, is a lively traditional style set where Pascal Gemme joins Colleen for a few Quebecois tunes.